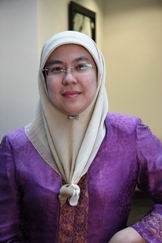 Dr.Norita Mohd Nasir is a Lecturer with the School of Business. Her current research interest is in the area of corporate environmentalism from an Islamic perspective, in which she has completed her doctorate degree. She has researched and presented papers at local and international conferences, and published her work in academic journals and periodic publications. She has also contributed book chapters in the area of Islamic accounting. Dr.Norita is a member of the Malaysian Institute of Accountants (MIA) and CPA Australia that carries the title of the Chartered Accountant (CA) and the Certified Practising Accountant (CPA), respectively. Her expertise in the accounting profession is recognized through her attachment to a number of professional bodies. Globalization of Financial Reporting in Malaysia: An Islamic Focus, Globalization of Accounting Standards, 2007, Edward Elgar, ISBN 978-1-84542-5. Zakat on Business in Malaysia- Issues and Current Treatment, Issues in Islamic Accounting, 2005, Universiti Putra Malaysia Press, ISBN 983-3455-07-7, pp.165-178. Voluntary Disclosure and Corporate Governance among Financially Distressed Firms in Malaysia, Financial Reporting, Regulation and Governance, Vol. 3, Iss. 1, 2004, pp. 95-139, Norita Mohd Nasir and Shamsul Nahar Abdullah. http://www.business.curtin.edu.au/index.cfm?objectId=55489367-D582-2975-B8105F3A1FB1979F (the electronic journal of the Accounting Standards Interest Group of AFAANZ). Accrual Management and the Roles of the Boards of Directors and Audit Committees among Malaysian Listed Companies: Evidence during the Asian Financial Crisis, International Islamic University Malaysia (IIUM) Journal of Economics and Management, 2004, Vol. 12, No. 1, pp. 49-80, Shamsul Nahar Abdullah and Norita Mohd Nasir. Voluntary Disclosure and Corporate Governance in Malaysia: The Case of Financially Distressed Firms, Berita CPA, July- September 2004, p. 2. Assets Valuations in Malaysia, Berita CPA, April-June 2003, p. 23. Zakat on business in Malaysia: The way forward, 4th International Islamic Banking and Finance Conference, Kuala Lumpur, 13-14th November 2006. The Association of Accruals and Cash Flow Measures with Malaysian firms’ Performances, 2006 Global Business and Technology Association International Conference, Moscow, Russia, 27 June - 1 July, 2006. Practices of Islamic Pawn Broking Operations in Malaysia, 3rd International Islamic Banking and Finance Conference, Kuala Lumpur, 9-10 September, 2005. Globalization of Financial Reporting: An Islamic Focus, Monash Institute of Global Movements Conference, Prato, Italy, 23-25 May 2005. Voluntary Disclosure in Malaysia: The Case of Financially Distressed Companies, The Economics & International Business Research Conference, Miami, Florida, 15-18 December, 2004. The importance of professional qualifications, Courses Now, December, 2006, pp. 72-73. Fair Value Accounting Techniques, Business Times, 18 May 2006, p. 50. Fair Value Accounting: Coping with the new challenges, Business Times, 23 March 2006, p. 47. Workshop on Accounting & Finance for non Finance Managers and Executives, Grand Plaza Park Royal, Kuala Lumpur, 21-22 September 2005, invited speaker. Profit Vs Cash: Contemporary Issues, Seminar on Zakah as a Measure of Efficiency and Effectiveness of a Business Entity, Shah Alam, Malaysia, 22-23 June 2005, invited speaker. Voluntary Disclosure in Malaysia: The Case of Matched Pair PN4 Firms, CPA Research Seminar: Bridging the Gap, Petaling Jaya, Selangor, 20 January 2005, invited speaker.